Teaching English can be a lot of fun! Even as a native speaker, though, there may be times when you are unsure of your knowledge and understanding of the language. It is sometimes difficult to elaborate on what we know, especially if there are some technical and minor grammar rules with which we may be unfamiliar. This is especially true for those who teach ESL, as ESL students will commonly compare English grammar to their own native languages. Therefore, it is helpful to have guides and sources of plans and strategies to further develop your own knowledge and skills. On this list, we have identified 20 of the best resources for English teachers. Resources range from websites to publications. You may already be familiar with some items on the list, but we’re willing to bet there are some new resources here that will greatly benefit you. For the reason stated above, several of these resources are geared and designed with the ESL teacher and students in mind. However, many of these resources will be useful for new English teachers who want to learn more strategies and techniques. To start off our list, we chose Goodreads. This website is an excellent resource for finding book recommendation for a class. The website allows users to organize the books into different, user-customizable “shelves,” allowing for quick reference at a later time. For ESL teachers, UsingEnglish is an excellent resource for your class. It contains an extensive collection of materials, ranging from grammar rules, language tests, and idiomatic expressions for students, to handouts and lesson plans for teachers. 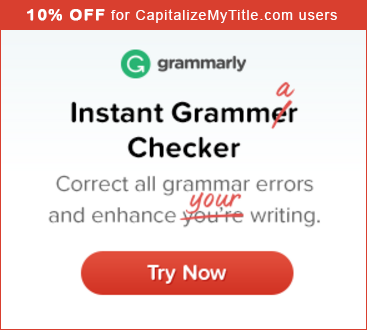 Full disclosure, I am a Grammarly affiliate, but I cannot live without this tool and I think it is a great resource for students and teachers alike. They even have a program called Grammarly@edu for teachers. I use the free for Chrome plugin and it is so much better than the built-in Chrome spell-checker. Every time I write a blog article, Grammarly scours my post to find any issues with my spelling or grammar. They even offer plugins for Microsoft Office so you can use the power of the tool from within Windows! I have never paid for the Premium version and enjoy the benefits of the free version all the same. Purdue OWL is also a great resource for English teachers who want to improve their knowledge of writing styles, grammar, and proper citations. It primarily acts as a reference guide for using various styles, such as MLA, APA, and Chicago. Handouts and online practices are available, as well. Kahoot makes it easy to construct exciting trivia quizzes and learning games in a matter of minutes. In this platform, you can create topic-specific questions that are tailored to your class and its needs. There are also learning games available for tablets and smartphones. Kahoot is an easy way for English teachers to integrate technology into their teaching. FluentU contains thousands of videos, ranging from movie trailers and music videos to inspiring talks. It includes an integrated dictionary that provides definitions, audio, and images, which help explain difficult concepts found within the videos. The website also provides an immersive experience with video quizzes, assignments, and much more. This site is especially interesting, in that it has materials for a wide range of languages. As I mentioned earlier, this list is not only comprised of websites. Some of these are publications where you could find the latest journals about current trends in teaching English. For example, the American Council on the Teaching of Foreign Languages (ACTFL) offers pointers for aligning your curriculum to national standards. It is an excellent way to stay abreast of the latest guidelines and philosophies for teaching English. Center for Advanced Research on Language Acquisition (CARLA) is another publication site where teachers can purchase PDFs and books. These resources contain the latest topics in language education. While these are not resources that can directly aid you in your teaching, they are certainly resources that can aid in your professional development. Scholastic has great resources for teachers who want to make teaching a lot easier and more engaging. With ready-to-go lesson plans and reproducible materials, Scholastic Teachables does just that. It’s handy and exhaustive list of resources, organized by all manner of categories (such as topic, themes, or grade levels), can save you hours of time preparing your lessons. With Scholastic’s Book Wizard, your students can discover books specifically meeting their reading level. Users can also filter the levels according to Guided Reading, DRA levels, Grade Equivalents, and Lexile measures. Book Wizard is an excellent way to select books that individual students can read themselves at their own pace. For those who are looking for excellent visual materials, we recommend The Literacy Shed. The Literacy Shed is home to a rich number of video clips, ideal for students who learn better by watching. The videos are organized by topic, and there are over thirty topics from which to choose. Aside from these resources, the site also provides lessons to aid in reading and comprehension. EnglishGrammar.Org is another excellent website for those who want to devote their time to helping students improve their grammar. The website provides grammar lessons, rules, and exercises. This is an excellent way to help students improve their writing skills and oral communications. Everything is covered for everyone, regardless of the level of difficulty. Common Sense Media helps teachers navigate the world of technology by providing reviews to help you find the right app, website, or game. The site also contains lots of tricks and tips to improve your teaching, Fas well as advice and reviews for new educational technology tools. We have also included Pink Monkey as one of the best resources for English teachers. There are a lot of reasons why. Primarily, it offers a large compilation of free online literature summaries. In addition, there are over 460 study guides and book notes with which you can elaborate on your lessons. This is a great site for ESL teachers. The site discusses how to teach and learn the language, providing lesson plans, how-to guides, and activities to further improve your teaching approach. Crash Course is the brainchild of brothers John and Hank Green. It is a YouTube channel devoted to teaching concepts ranging from math to literature. John typically handles the literature and English component, offering engaging explanations of various pieces of literature. Combined with remarkable animation, his witty overviews offer memorable English lessons. English Grammar Online is another website that focuses on teaching English as a foreign language. This site offers exercises, tests, and other activities, all aimed to help the ESL teacher teach and test effectively. ESLpartyland.com provides English teachers, especially those who teach ESL students, with some engaging materials to further motivate the students to learn the language better. These include films, videos, music, and other engaging activities. With Busy Teacher, you have access to a database of more than 17,300 free printable worksheets and lesson plans. Whether your student is still a beginner or already advanced, Busy Teacher can help you save several hours of preparation. Aside from providing resources essential in class, Busy Teacher also provides professional development articles to help you grow as a teacher. To complete our list, we included Turnitin. This resource allows you to interact online with your students’ papers. Fully compatible with Blackboard, Canvas, Noodle, and other education platforms, Turnitin offers comprehensive grammar discussions, grading rubrics, and even plagiarism checks. It provides a great place for your students to learn and study writing from the first draft to its final submission. In all honesty, there are really more than just 20 excellent resources for English teachers. It all comes down to your needs and preferences. Regardless, there are enough options here to allow any teacher, regardless of needs, to find the resources he or she needs to become a better, more well-rounded English teacher. In fact, we hope this list helps you become a great English teacher!